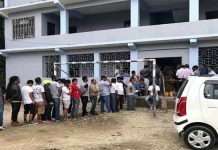 Kolkata: As many as 23 anti-BJP political parties have demanded that Election Commission of India (ECI) must counter-check 50 per cent of the paper trail from electronic voting machines (EVM) that will be put to use for the coming Lok Sabha polls. These are the parties that attended Trinamool’s United India Rally at Brigade Parade Ground in Kolkata today. 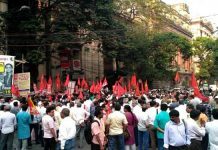 They include prominent parties like Congress, Trinamool, NCP, Aam Admi Party, Samajwadi Party, Bahujan Samajwadi Party, Telugu Desam Party, National Conference, etc. After the rally, they held a 30-minute meeting at Bengal government banquet Soujanya at Alipore in the city. In the meeting, they unanimously resolved to keep an eye on the use of EVMs and pursue the matter with the ECI. “We have formed a committee comprising (Delhi Chief Minister) Arvind Kejriwal, (Congress Rajya Sabha MP) Abhishek Manu Singhvi, (Samajwadi Party chief) Akhilesh Yadav and, (Bahujan Samajwadi Party leader) Satish Sharma. They will guide us on the matter and draft a memorandum to be served to the ECI,” Trinamool chief Mamata Banerjee told a joint Press conference. The development comes after two leaders ~ National Conference president Farooq Abdullah and, Andhra Pradesh Chief Minister Chandrababu Naidu flagged the issue at the public rally earlier today. They expressed apprehensions that EVMs can be tampered and, said that there could be an attempt at cheating through EVMs in the coming Lok Sabha polls. Both of them even demanded that instead of EVMs, the vote should be taken on ballot papers. But during the meeting at Soujanya later, all the leaders conceded that since barely two months are left for the elections, ECI should be allowed to use EVMs with a rider. “Since there is little time for the LS poll, our demand is that ECI must ensure 100 per cent use of voter-verifiable paper audit trail (VVPAT) and, more importantly, 50 per cent of the VVPATs must be cross-checked through physical verification of the paper trail during counting,” said Singhvi. 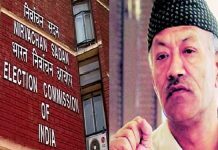 Farooq Abdullah, who had flagged the matter in the rally, said that all the top leaders of the party will meet the ECI in Delhi soon to place the demand. Mamata Banerjee said that all the leaders will meet in Delhi on the side-line of the Budget Session of the Parliament to finalise a common minimum agenda for the anti-BJP coalition. Despite being apprised of the fresh allegations hurled against the EVM today, ECI spokesperson from Delhi has not yet responded.